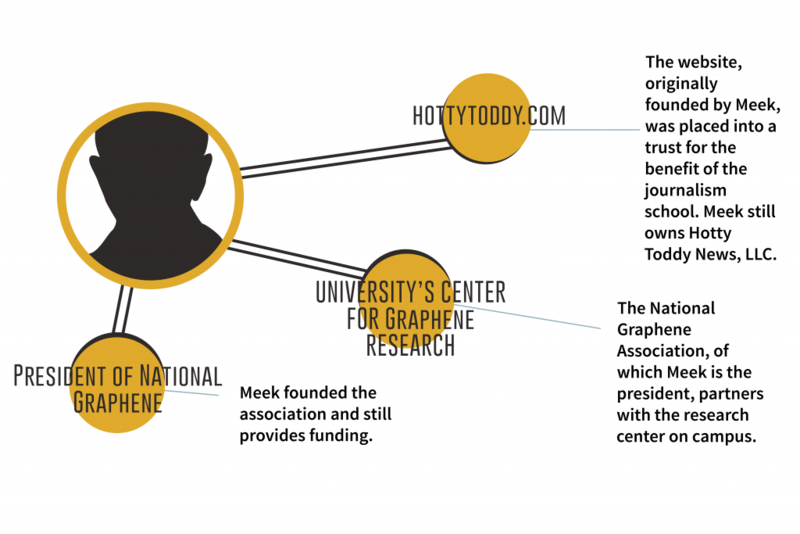 Last semester, the Mississippi Institutions of Higher Learning approved the University of Mississippi’s request to remove prominent university donor Ed Meek’s name from the School of Journalism and New Media, but Meek still maintains indirect connections to the university through HottyToddy.com and the Center for Graphene Research and Innovation. Meek founded the news website HottyToddy.com in 2012 with the intention of eventually gifting it to the university and making it a platform for journalism students at Ole Miss to publish their work. The website currently operates under the School of Journalism and New Media, and many journalism professors submit students’ classwork to the website. On September 9, 2018, HottyToddy.com and related assets were placed “into a trust for the benefit of what was then the ‘Meek School of Journalism and New Media’ to fulfill Dr. Meek’s vision,” according to the website. However, Ed Meek’s company Hotty Toddy News maintains the power to revoke the trust if the university fails to follow the standards set forth in the agreement and in the trust document. These standards require the university to, among other things, “acknowledge publicly” that HottyToddy.com and its assets were made available to the school by Ed and Becky Meek, to reinvest any revenue generated from the website into “Meek School instructional activities and programs” and to utilize the services of existing Hotty Toddy employees. Additionally, the university can decide, for any reason, upon 60 days notice, to return HottyToddy.com and the other trust assets to Hotty Toddy News, which would effectively return control of the website to Meek. Will Norton, the dean of the School of Journalism and New Media, and Rachel West, the website’s publisher, both said they are unsure of the nature of this trust and directed all questions to the university’s chief legal counsel Erica McKinley, who declined to comment. Anna Grace Usery, the editor-in-chief of HottyToddy.com, said she has never seen the full contract between the university and Hotty Toddy News. West also said Meek is no longer directly involved in the operations of HottyToddy.com and has no editorial control over content or profits. However, Meek does have monetary influence over the National Graphene Association, which often partners with the Center for Graphene Research and Innovation at the university. Meek is the founder and president of the NGA, an organization based in Oxford that advocates for and promotes the commercialization of graphene, a form of flexible carbon used in a variety of technologies. While Meek does not have a direct connection to graphene research on campus, the NGA does, working closely with the university’s Center for Graphene Research and Innovation by hosting conferences and helping the center monetize its research. Josh Gladden, the vice chancellor for research and sponsored programs, serves on the advisory board for the NGA. He said the graphene research center has subcontracted the NGA for consulting services on an economic development grant. In an email obtained through a public records request, Meek wrote Norton on Sept. 22, 2018, three days after his Facebook post, saying he was planning to take a step back from the organization but would continue to fund it. “I hope the university can look past the current environment, continue to partner with the NGA and take personal advantage of this opportunity to provide leadership so vital to our nation,” Meek wrote. Norton was, at one time, a member of the NGA advisory board, but he said he was removed from the board without being informed of the reason. Norton also said the journalism school does not have any current ties to the NGA after his removal from the board, but, in an email obtained through a public records request, Scott Fiene, the assistant dean of curriculum and assessment, said Leslie Westbrook, an adjunct professor for integrated marketing communications for the journalism school, was on the NGA board as well. In the same email, Fiene said he hoped Westbrook could be a representative and connection for the school. “She can keep us apprised of aspects that might be of interest to us,” Fiene wrote. Westbrook still serves on the advisory board, according to NGA’s website, but she did not respond to requests for an interview. While Meek’s name has been physically removed from the Ole Miss campus, his influence, personal projects and financial involvement remain, albeit thinly veiled.